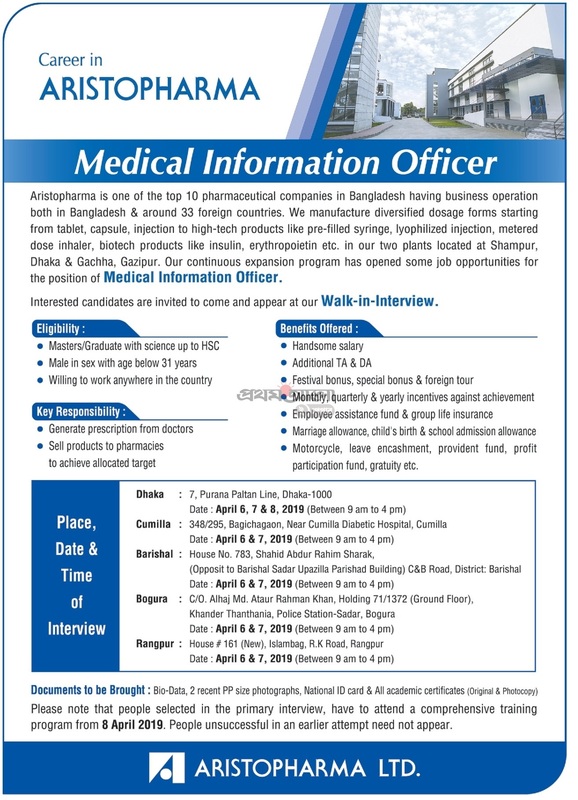 Aristopharma Ltd job circular 2019 has been published by their authority in daily online job portal and to get from the best jobs and the education portal website in BD Jobs Careers- www.bdjobscareers.com. Well, Aristovision is the Ophthalmic division of Aristopharma. It started the operation in 2002 and just within 4 years it conquered the no. 1 position in the ophthalmic market of Bangladesh. Since then it has been maintaining this leadership position in Ophthalmic market of the country. Its products are exported to Asia, South-East Asia, Oceania, Africa and Latin America. In Myanmar It is also the leader in Ophthalmic segment. Uncompromised product quality, world class packaging, wide range of products and above all a dedicated and highly professional sales team has brought this success for Aristovision. To meet our ever-growing market need we are recently looking for some intelligent and target oriented candidates for our Aristovision sales team. If you have the passion to work in a CHAMPION TEAM then join our Aristovision sales team as Medical Information Officer. ■ Salary: As per company policy. ■ Applying Procedure: To See Below Job Circular Image. You would like to get new government jobs circular to visit the best online job portal website in BD Jobs Careers- www.bdjobscarers.com and keep with Facebook Page and Join Facebook Group for time to time update. We have been providing category wise new job advertisement such as government jobs circular, private job circular 2019 in Bangladesh, recent bank jobs in Bangladesh, international organization jobs in Bangladesh, multinational company job circular in Bangladesh, private and government university jobs in Bangladesh, online newspaper jobs in Bangladesh, download admit card, exam result, exam routine, exam suggestion and more for people. Just visit in regularly, hope you must benefited by getting our publishing jobs circular information. Thanks for visit BD Jobs Careers. This entry was posted in HSC Pass Jobs, Medical/Pharma, Pharmaceutical Jobs, Private Job by Shium Mahmud. Bookmark the permalink.